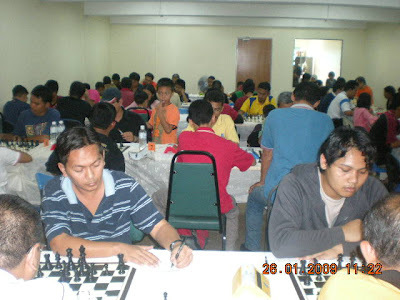 MMU Melaka Chess Open - BUKAN FIDE-rated tournament! 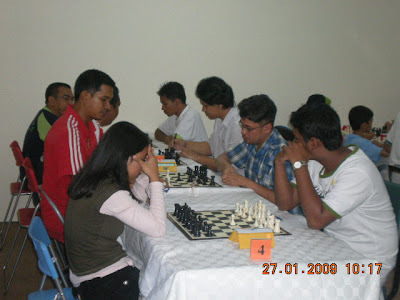 Pada pandangan GiLoCatur, memang syarat-syarat di atas agak berat bagi kebanyakan pengajur chess tournament di negara ini kerana selalunya bajet yang kecil. Berkenaan dengan syarat-syarat (requirement) nak mendapatkan FIDE rating yang selama ini GiLoCatur pun masih kurang jelas, berikut adalah kaedahnya. Perlu berlawan dengan 9 pemain yang ada FIDE-rating. 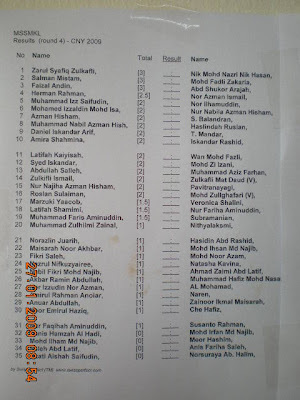 9 permainan tersebut dibahagikan kepada 3 kumpulan yakni 3 permainan untuk setiap kumpulan (grouping). Setiap permainan rated tersebut tak kan ada maknanya jika sekurang-kurangnya 1 point diperolehi dari 3 permainan kumpulan pertama, 1/2 point diperolehi dari 3 permainan kumpulan kedua dan 1/2 point dari 3 permainan kumpulan ketiga. 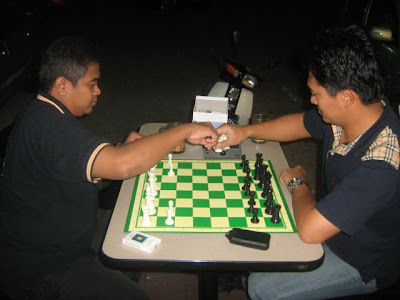 1) Katakan GiLoCatur bermain di dua kejohanan catur bertaraf FIDE-rated. Dalam kejohanan pertama GiLoCatur tak bertemu lansung pun dengan pemain FIDE-rated. Jadi tak ada norm pun yang GiLoCatur dapat. Kemudian dalam kejohanan kedua, GiLoCatur dapat lawan 4 orang pemain yang ada FIDE rating, tapi hanya dapat 1/2 point daripada ke empat-empat permainan tersebut. GiLoCatur masih tak dapat norm lagi sebab perlukan sekurang-kurangnya 1 point untuk 3 permainan kumpulan pertama. Point lawan pemain-pemain yang tak ada FIDE rating tak kira. 2) Kemudian GiLoCatur bermain dalam kejohanan bertaraf FIDE berikutnya. Dalam kejohanan tersebut GiLoCatur bertemu dengan 5 orang pemain yang ada FIDE rating. Dapat 1 1/2 point pula dari 5 permainan tersebut. Baru GiLoCatur dapat norm rating. GiLoCatur hanya perlukan 4 FIDE-rated games lagi dan score 1/2 point untuk lengkapkan norm dan dapat rating FIDE. 3) Atau katakan GiLoCatur sertai satu kejohanan FIDE-rated. Dalam kejohanan tersebut GiLoCatur lawan 9 orang pemain yang ada FIDE rating dan score 2 point. 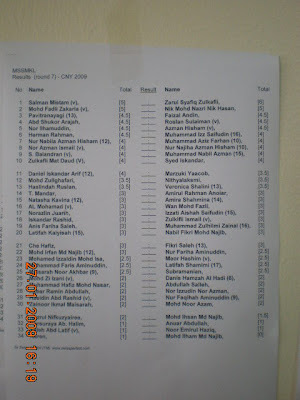 Ini bermakna GiLoCatur dah cukup norm untuk dapat FIDE rating sebab 1 + 1/2 + 1/2 = 2. Begitulah lebih kurang macam mana nak dapatkan FIDE rating. Ada faham ke? hehehe Harap tidak confuse. So, sekarang bila dah faham macam mana nak dapat norm FIDE rating, bolehlah GiLoCatur merancang untuk dapatkan FIDE rating untuk anak-anak. Semoga anak-anak GiLoCatur berjaya dapat FIDE-rating dalam jangkamasa DUA tahun. Wish me and my children luck! 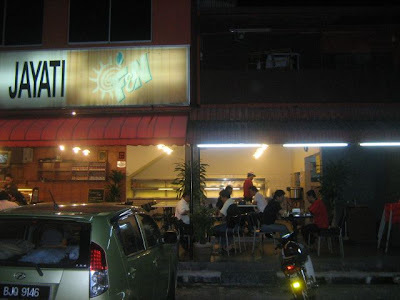 Bukit Beruang, 75400, Ayer Keroh, Melaka. FIDE 7 Round Swiss System. 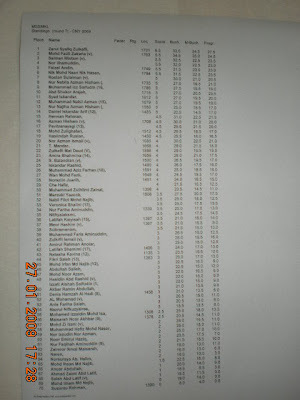 The maximum of participants 120 players. A team of 4 players for institution, school or a public group. 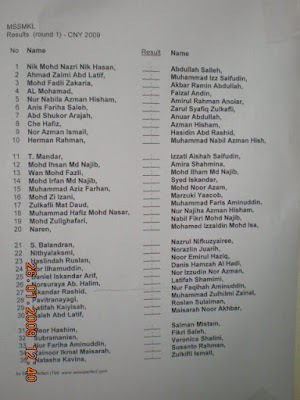 Age is taken as of 1st of January 2009. Each game will have a time control of 45 minutes per side. A walkover/win to opponent after 30 minutes. Players that are absent without a valid reason will be removed in the next round. Players are to record their moves. The arbiter’s decision is final. However, participants may appeal within 15 minutes of the subjected game. A fee of RM 50 will be charged. This fee will not be returned if the appeal fails. An appeal committee will be formed. The organizing committee reserves the right to make amendments or any changes to the rules and regulation if the need arises. To register, send an email to mmu.chessclub@gmail.com and cc it to leanjee@gmail.com/ladyfinger87@yahoo.com . State your name, identity card no, contact number, and institution (or group name). 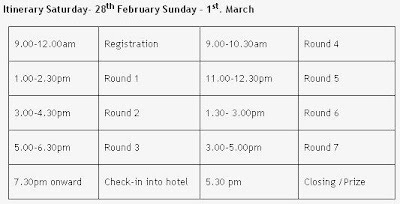 FIDE rating / National Rating be stated..
Accommodation can be arranged for at hotels. Arrangements for transportation from Melaka Sentral Bus terminal. State your time of arrival. 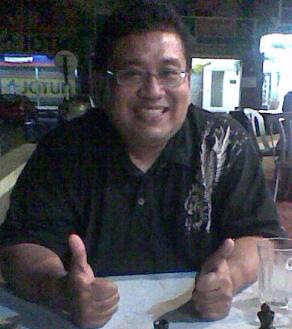 The SIFU.mycatur blog is created and maintained by Encik Abdul Latif Mohamad, one of Malaysian IAs (International Arbiter). 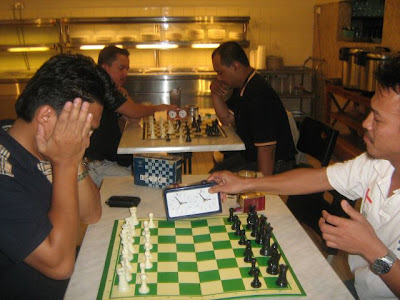 The effort is tremendous and very good to our local chess industry since he is very experienced and knowledgable especially in organizing and arbitering chess tournaments. Moreover, he can offer a venue i.e. KL Braille Training Center for any chess tournament. So check out his blog at http://sifumycatur.blogspot.com/. Kelab Chess SBPI Gombak is created and administered by a chess-lover student of Sekolah SBPI Gombak named Nabil Fikri Mohd Najib. GiLoCatur salutes his determination and strong spirit for chess eventhough he does not get a very good support from his school and its chess club especially when entering non-MSS local chess tournaments. His blog can be accessed at http://interchess.blogspot.com/. 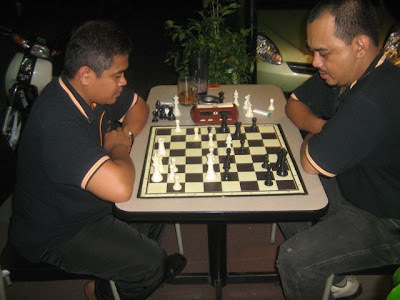 It is very common scenario in most schools in Malaysia where not many school chess club teachers are very supportive to their chess-loving pupils. 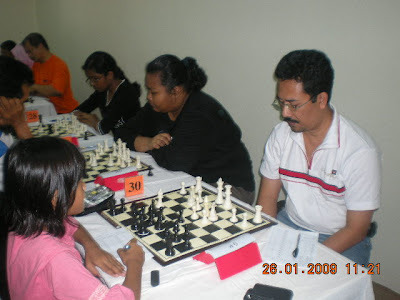 GiLoCatur urges to all school chess club teachers in Malaysia to provide a very strong support like having chess sets and digital clocks, providing chess coaching and training, and providing chess news, infos and tournaments to their pupils to help chess development in the country. With such efforts Malaysia will have bright future in chess and can be dominant in world chess like Vietnam and Philippine where they have many GrandMasters (GM). 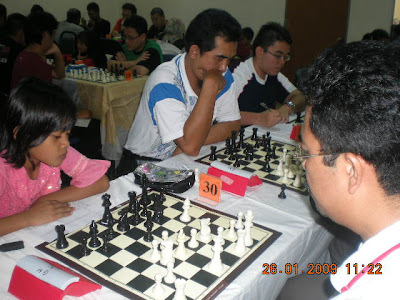 A salute to all determined and suportive teachers to chess in Malaysia. For the two new bloggers in the block, AL and Nabil, GiLoCatur says Welcome Aboard! Hope they can be a very consistant bloggers where their blogs are always updated. For all local chess lovers, let's support their blogs by visiting them and providing positive feedbacks. The full Final Results as the above. In Round 6, GiLoCatur met a young boy named Mohd Noor Azam on board 33. GiLoCatur thought could win the game but unfortunately it was otherwise. What a tournament for GiLoCatur. Basically, GiLoCatur lost all the games, just won a game for absent player. All the players participated in the tournament are quality ones even the kids. Actually, it is a good sign for Malaysian chess. 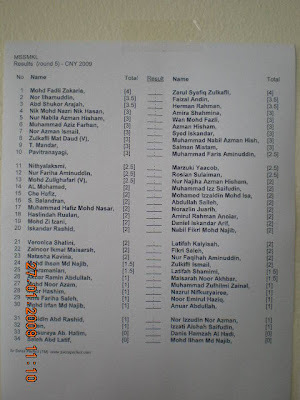 70 players had participated in the CNY tournament. Some come from far like JB, Seremban and Alor Star. Some just make comeback to chess tournaments. GiLoCatur had few discussions with some of the players on local chess topics and issues. 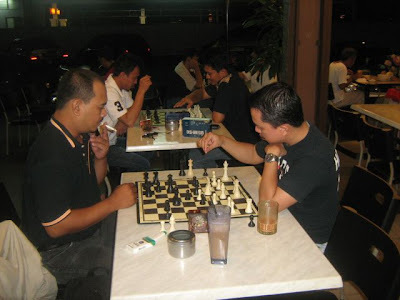 How chess can be improved in Malaysia. How chess can be developed and promoted. How Malaysia can be in the world chess map. 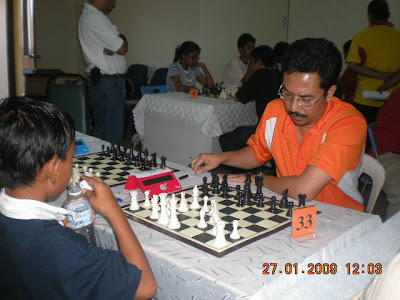 Fikri, GiLoCatur's eldest son was playing againts Cikgu Zullkafli. 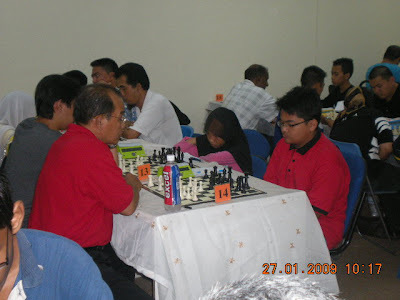 AL Mohamad, a seasoned chess player, againts a teenage chess player. 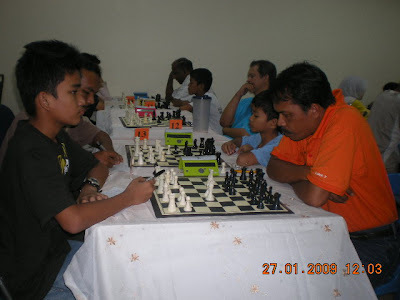 GiLoCatur had several games including blitz with a parent from Seremban, Suhairi and AL. 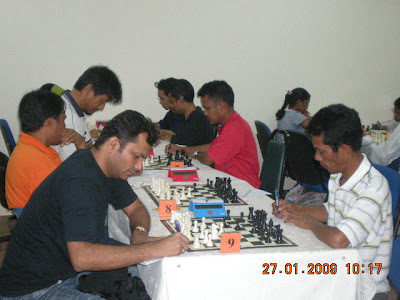 Other players had 5-minute blitz games among themselves while waiting for the prize giving ceremony. Entry RM 25 (Lunch provided) State rating. Register by phone at 03-4022 0046. 6 Rounds Swiss 20 mins with 8.00 am registration. Sibblings Nabil and Najiha were among those who suffered defeat in the first round. Nabil lost to Herman Rahman whereas Najiha lost Muhammad Hafiz. Herman continued his winning streak againts Azman, Nabil's father, in Round 2. Roslan Sulaiman with whom GiLoCatur had a sparring game on 24th January night and Syed Iskandar were among the perfect scorers i.e. 2 points entering Round 3. 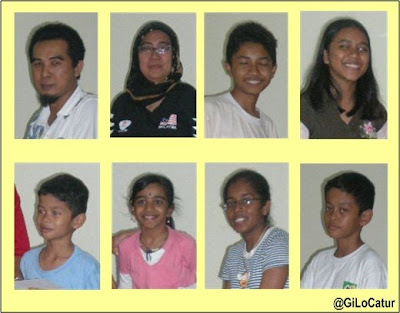 As for GiLocatur family, the results on Day 1 is not impressive. GiLoCatur and daughter, Anis, lost all the three rounds. GiLoCatur had a very tough fight in Round 3 againts Che Hafiz on last board he he he ... As for GiLoCatur's son, Fikri, only one game won. Staying in a hostel really takes a stroll on him. He got drowsy and headache in the hot climate since the tournament venue has yet have air-condition. Hopefully, on Day 2 with four games to play GiLoCatur's family will get better results. 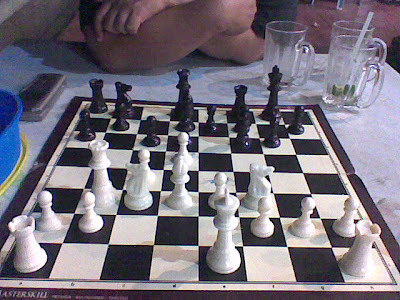 GiLoCatur was playing white againts Maisarrah Noor Akbar in Round 1. 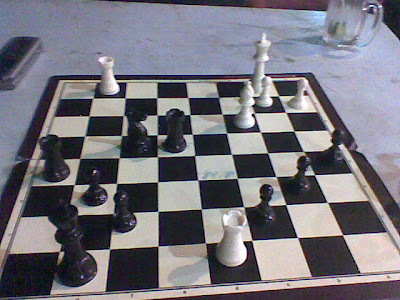 GiLoCatur was defeated by the girl in the endgame. In chess, age is not a barrier. A young player can outplay an adult player provided he or she has what it takes to do so. GiLoCatur had less than 3 minute while the girl had 30 minutes in one point. It is important to have enough sleep for a chess tournament since GiLoCatur slept late last night. But anyway GiLoCatur still happy with the play because no big blunder made he he he ..
Roslan Sulaiman, from the same hometown as GiLoCatur, is making a comeback to chess tournament. 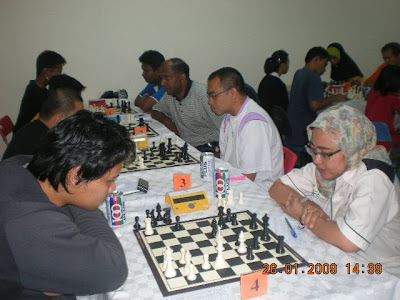 Seen Faizal Andin vs Haslindah Ruslan, MCF strong lady, on board 4. It is a good news for Malaysian chess players who want to play in international tournament. NM Kamal Abdullah offers "Jalan-Jalan Main Catur" package. The first destination is Bangkok for the 9th Bangkok Open from 1st to 6th April 2009. 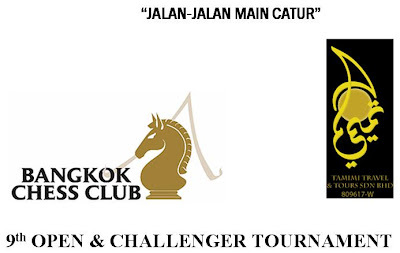 Please go to http://www.bangkokchess.com for more details on the tournament. 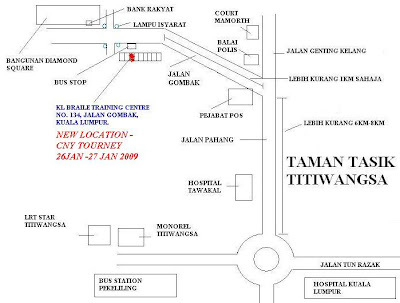 The venue for CNY tournament has been changed to KL Braille Training Center on Jalan Gombak. Check the map to the venue. 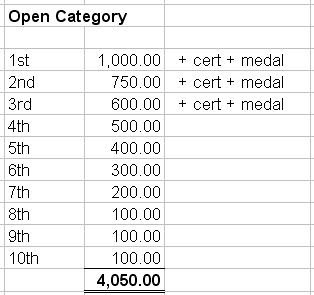 For category 1 (Rapid Open), 15 prizes are to be won for the Open section whereas 10 prizes for JAIS players. In total for the 25 prizes, RM 3,550 (RM 2, 200 + RM 1,350) is allocated for this category. 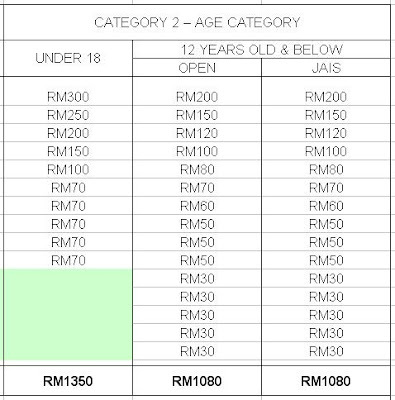 For Category 2 (Rapid Age-group), 10 prizes totalling RM 1,350 is for the Under 18 players to win. 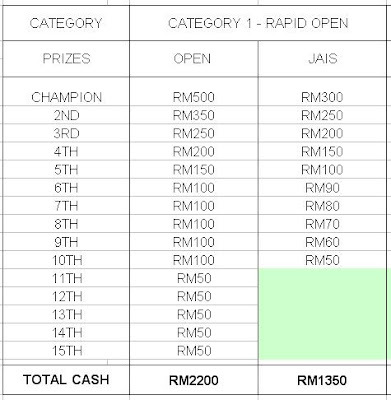 While for Under 10, both Open and Jais, there are 15 prizes each. 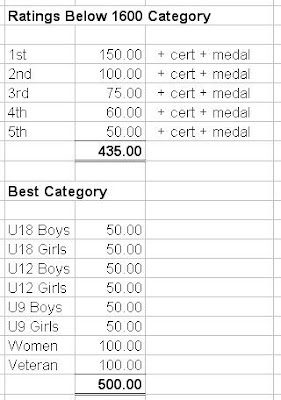 In total, RM 2,160 is the amount for Under 12 categories. There are also several consolation prizes to be won. So lots and lots of prizes for the tournament. SO, COME JOIN THE THE KLANG OPEN TOURNAMENT ON 7th FEBRUARY 2009. BOOK THE DATE !! 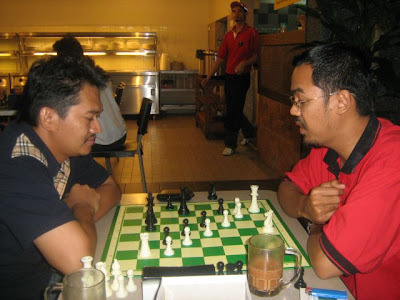 Syed Abdul Rahman (red shirt), one of the Klang Chess Open organizers, planning how to attack Sahir (black). Cg Mizi thinking deeply not to be outsmarted by Zahorin. Game had not started but Sahir had begun preparing his lines. Max was being careful of his move. Thanx to Zali aka Ng6 for emailing GiLoCatur the above pictures. 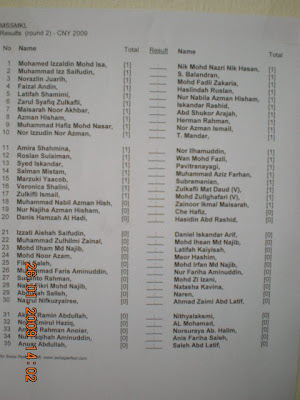 Maybank Account No: 562067-507199, made payable to Biro Ekonomi Majlis Guru Besar Sekolah Agama Daerah Klang. 2. New Closing Date : 3rd February 2009. 3. New route map attached. ~ From Klang Komuter Station - just 2.5km @ taxi rate RM5 - RM7 only. Only paid entrance will be accepted!! No entrance accepted after closing date!! 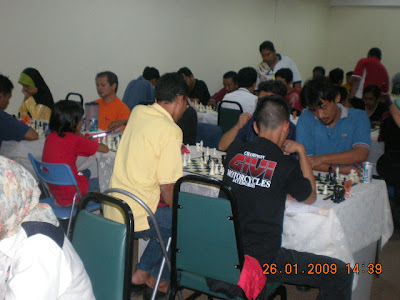 In response to the visit of Brunei Chess Team, Sarawak Chess Association will be organising Boulevard Rapid Chess Competition. TOTAL CASH PRIZES : RM7410.00 TO BE WON !!! NOT-TO-BE-MISSED : LUCKY DRAW DURING PRIZE GIVING !!!! Register through SMS, deposit entry fee to 'Badan Kebajikan Kakitangan PAID Klang' - Bank Islam Account No: 12010010017749 and fax bank slip to 03-33231319 before closing date ( 31 January 2009 ). ONLY PAID ENTRANCE WILL BE ACCEPTED. STRICTLY : Registration Or Payment After Closing Date WILL NOT BE ENTERTAINED! 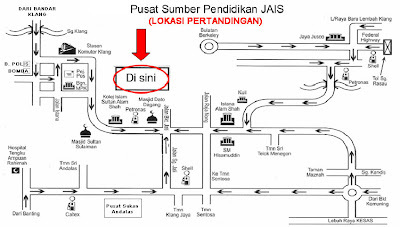 Map to the tournament venue in Kampung Jawa, Kelang. 7 rounds SWISS system. 45 minute time control. Free drinks to all players (non-playing parents not included GiLoCatur presume) during the tournament. *** Evidence and proof is required for school children of MSSKL schools, otherwise the fee will be similar to non-MSSKL student. The Prizes - RM 4,985.00. Download below image, print it! Another national-rated chess tournament. Do not miss it Malaysian chess lovers. Pre-registration by e-mail to selangorchess@gmail.com is BEFORE 15 January 2009. THIS TOURNAMENT IS POSTPONED TO 15th FEBRUARY 2009!! Venue : City Square,Johor Bahru,Johore. tournament system : 7 rounds swiss. GiLoCatur found a link to chess articles and book reviews that may help chess lovers get info on a particular chess book to buy. 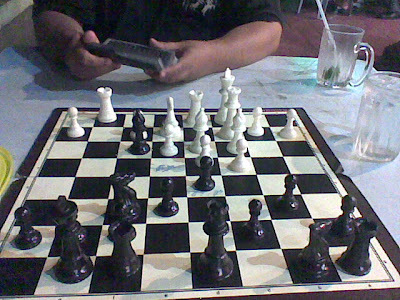 Few hours ago, GiLoCatur had a a series of chess matches with an old buddy, Wak Fatkur at a mamak restaurant in BJ. 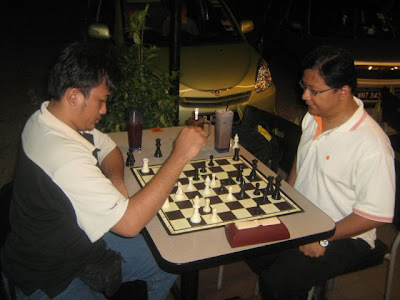 Fatkur was active playing chess while studying in UiTM in early 90's. According to him, during his time UiTM was strong and dominant at MASUM. Before tonite, we had few matches but online. So, tonite was our first on board matches. 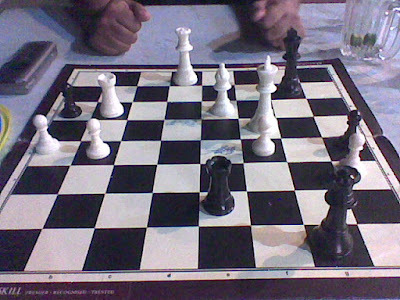 Round 1 - GiLoCatur played black. 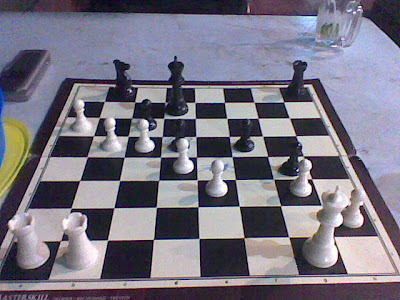 Wak Fatkur played white. GiLoCatur played very aggresive with quick moves. GiLoCatur was up 3 pawns, but was trapped by a strong bishop. 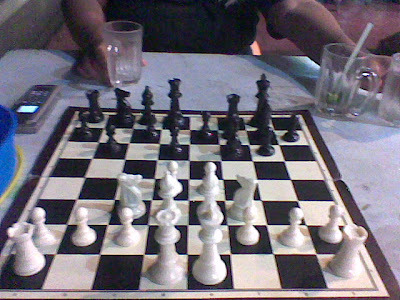 GiLoCatur 0, Fatkur 1. Round 2 - GiLoCatur played 1. d4 with white. Exchanged queens in the mid-game. Fatkur could not handle GiLoCatur's knight. He resigned after above position. 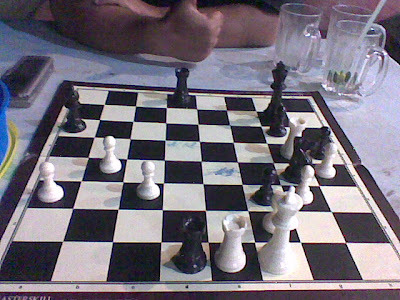 GiLoCatur 1, Fatkur 1.